Lemierre Syndrome; Jugular Veins; Sepsis; Pulmonary Embolism; Bacterial Infections; Abscess. Lemierre’s syndrome is a rare, life-threatening condition, which may be fatal if not properly treated. This disease refers to thrombophlebitis of the internal jugular vein, which is the result of bacterial sore throat infection (usually in the form of pharyngitis) that extends into the parapharyngeal space. However, it can result from other infective foci in the ear, nose, parotid glands, and paranasal sinuses. The bacteria typically responsible is Fusobacterium necrophorum. Here, we describe a case of Lemierre’s syndrome that occurred in a 20-year-old female who presented with neurological deficits following a two-week history of upper respiratory tract infection. Our case displayed typical findings of this rare condition with a review of the previous literature and also to emphasize the importance of high index of suspicion to reduce the mortality of this disease. We describe a case of Lemierre’s syndrome in a 20-year-old Omani female who presented with neurological deficits following a two-week history of upper respiratory tract infection. Our case presents typical findings of this rare condition and a review of the previous literature. Our report emphasizes the importance of a high index of suspicion to reduce the mortality of this disease. To the best of our knowledge, this is the first described case of Lemierre’s syndrome in Oman. A 20-year-old woman with no history of medical illness presented to a primary health care center in Oman with fever, sore throat, and attacks of hemoptysis lasting two weeks. She was diagnosed with upper respiratory tract infection and treated with oral antibiotics. A few days later, she developed weakness of the left upper limb and was referred to Sultan Qaboos University Hospital. She underwent head computed tomography (CT), which revealed a right thalamic lesion suggestive of an abscess. She was then admitted to the hospital. On admission, the patient appeared conscious but ill. She was mildly febrile and had tachypnea and tachycardia. Her oxygen saturation was still maintained. Chest examination showed bilateral crepitation, which was more on the right side. Neurological examinations revealed mild weakness in the left upper limb. The initial chest radiograph showed multiple nodular infiltrates and small pleural effusion. She was diagnosed with pneumonia with brain abscess. Initial laboratory tests revealed a white cell count of 21.5 × 109/L (neutrophils 17.9 × 109/L), red blood cell count of 5 × 1012/L, platelet count of 444 × 109/L, C-reactive protein levels of 323 mg/L, and hypochromic microcytic anemia with hemoglobin levels of 10.1 g/dL. Her blood culture was negative. Figure 1: (a) Axial T1-weighted contrast-enhanced magnetic resonance imaging of the brain showed right thalamic abscess (red arrow). 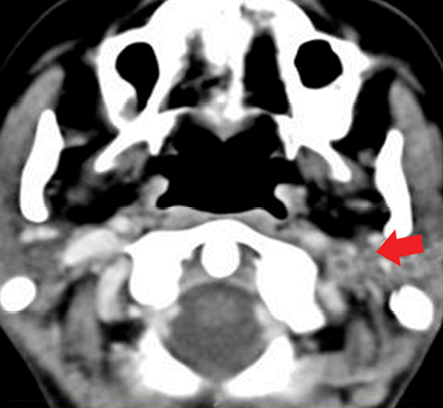 (b) Magnetic resonance angiography showing non-visualization of the transverse sinus, sigmoid sinus, and the internal jugular vein (red arrow). An echocardiogram was carried out to rule out infective endocarditis, and showed negative results. Brain magnetic resonance imaging (MRI) and magnetic resonance angiography were performed revealing a right thalamic abscess as well as extensive cerebral venous thrombosis involving the left IJV, left straight, and sigmoid and transverse sinuses [Figure 1]. Chest CT was performed for further evaluation of the lungs and major vessels in the neck, which revealed multiple bilateral lung consolidations and atelectatic changes and filling defects in the segmental branches of the pulmonary arteries in keeping with pulmonary embolism [Figure 2]. It also showed thrombosis of the left IJV [Figure 3]. Figure 2: (a) Pulmonary angiography with computed tomography of the chest showing a filling defect denoting embolism in the lower lobe segmental branch of the left pulmonary artery (red arrow). (b) The lung fields show multiple atelectatic changes (red arrows) and bilateral pleural effusion. In view of these imaging ﬁndings, a diagnosis of Lemierre’s syndrome was made. She was started on intravenous antibiotics (ceftriaxone 2 g twice daily, cloxacillin 2 g every six hours, and clindamycin 600 mg every six hours) and anticoagulation therapy (enoxaparin). Following treatment, the patient showed dramatic clinical improvement with all blood parameters returned to normal. Repeated chest radiographs showed improvement of the pulmonary shadowing. A follow-up brain CT showed a reduction in the size of the abscess. She was then discharged on oral antibiotics. The patient did not make further outpatient visits, although advised. Review of the previous literature shows that fever, sore throat, neck pain, and neck lymphadenopathy are the most common first presentation of the disease.3–8,11,12 Thrombosis of IJV is detected in Doppler ultrasound of the neck or CT study. Some cases complicated with metastatic infection, mostly to the chest.3,4,6,7,11 Our case of Lemierre’s syndrome presented with similar symptoms of a sore throat with fever and complicated with metastatic infection to the chest and brain. Early suspicion and recognition of the disease by physicians and radiologists is crucial for early management and prevention of further spread of infection. Lemierre’s syndrome should be suspected in young, healthy patients with prolonged symptoms of pharyngitis. Such patients could develop septicemia, pneumonia, or atypical lateral neck pain. It is a rare disease in the modern era of antimicrobial therapy. The diagnosis is often confirmed by the identification of IJV thrombophlebitis by imaging and growth of anaerobic bacteria F. necrophorum on blood culture. The treatment is prolonged antibiotic therapy combined with anticoagulants. 1. Dholakia S, Hashimi Y. Doctor, I have a sore throat. BMJ Case Rep 2013 Jan 31;2013. pii: bcr2012007736. 2. Love WE, Zaccheo MV. Lemierre’s syndrome: more judicious antibiotic prescribing habits may lead to the clinical reappearance of this often forgotten disease. Am J Med 2006 Mar;119(3):e7-e9. 3. Harper LK, Pflug K, Raggio B, April D, Milburn JM. Clinical images: Lemierre syndrome: The forgotten disease? Ochsner J 2016;16(1):7-9. 4. Alherabi A. A case of Lemierre syndrome. Ann Saudi Med 2009 Jan-Feb;29(1):58-60. 5. Eilbert W, Singla N. Lemierre’s syndrome. Int J Emerg Med 2013 Oct;6(1):40. 6. Kushawaha A, Popalzai M, El-Charabaty E, Mobarakai N. Lemierre’s syndrome, reemergence of a forgotten disease: a case report. Cases J 2009 Mar;2(3):6397. 7. Dorfman A, Shokoohi H, Taheri MR. Lemierre’s syndrome and rapidly deteriorating respiratory failure in the emergency department. Am J Emerg Med 2012 Oct;30(8):1658.e5-1658.e7. 8. Prakashchandra SP, Patel AK, Patel K, Doshi RK, Patel NA. Grave complication of pharyngitis: Lemierre syndrome. J Clin Diagn Res 2015 Jun;9(6):TD03-TD04. 9. Holm K, Svensson PJ, Rasmussen M. Invasive Fusobacterium necrophorum infections and Lemièrre’s syndrome: the role of thrombophilia and EBV. Eur J Clin Microbiol Infect Dis 2015 Nov;34(11):2199-2207. 10. Al-Yamani A, Khamis F, Al-Zakwani I, Al-Noomani H, Al-Noomani J, Al-Abri S. Patterns of antimicrobial prescribing in a tertiary care hospital in Oman. Oman Med J 2016 Jan;31(1):35-39. 11. Hadjinicolaou AV, Philippou Y. Lemierre’s syndrome: A neglected disease with classical features. Case Rep Med. 2015; 2015:846715.